Signature Member Artist of Texas, Oil Painters of America, American Impressionist Society, NOAPS, Southwest Artist. Get the Daily Painters of Texas widget and many other great free widgets at Widgetbox! Luckily after many years as a corporate executive and serving on the Board of Directors for BET Services Pat got to pursue a passion she had admired for many years. Studying with National artist Judy Crowe, Robert Johnson, Chuck Rawles, Qiang Huang and Gregg Kruetz. She has had the opportunity to show her style of art in the Brenham Fire Arts Gallery, Texas A&M Executive offices, Conroe City Hall of Texas, Sugarland, TX Corporate Airport, Office of American Heart Association, Emerging Artist of Texas and many other venues. Winning Best of Show along with many other awards for her paintings. Her clients have enjoyed her representational style of art. 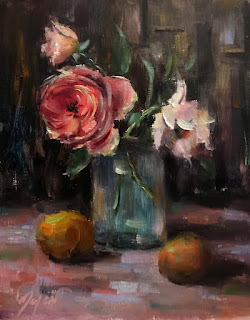 The still life and landscape show her love of color and the expression that can be portrayed in each of her paintings. Pat does commission works of still life, landscapes and portraits. Sometimes she incorporates a valued personal treasure that represents a part of their lives into the paintings that she does. Her love of painting and life will be continued into her future paintings.